Use to secure stacked bags (between courses) for secure construction. Barbed wire acts like Velcro® to prevent bags from sliding or shifting. Bekaert ZA four-point wire in a 1,320 feet roll. Barbs are spaced 5" apart. 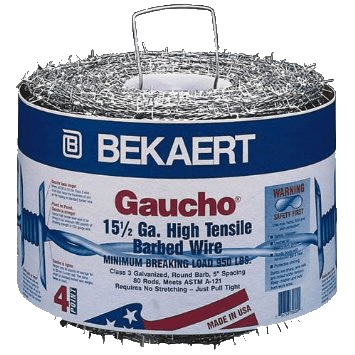 The wire is 15.5 gauge and galvanized for corrosion-resistance. We like this because it's lighter weight & has equal strength (and it's much cheaper!) in comparison to more common 12.5 gauge low-carbon wire. Make a sawbuck with a pipe to support your roll and to make unrolling easier. Exercise caution when unrolling & cutting because it can whiplash if you're not careful and cause damage to you and onlookers. You might also want to order some leather welding gloves with 14" gaunts to protect your hands, wrists & forearms.